FancyThemes offer professionally crafted niche WordPress themes. They have a good collection of gorgeous WordPress themes that you can use. All FancyThemes come with a guaranteed updates and support from their team. When you use our exclusive FancyThemes coupon, you can get an additional 15% off your purchase. How to Use FancyThemes Coupon Code? 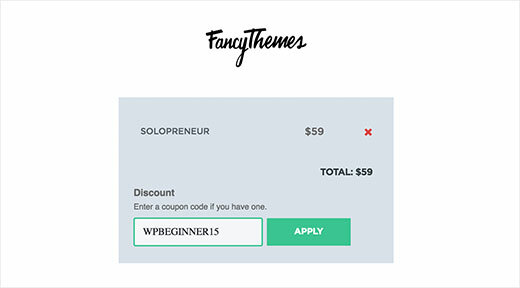 WPBeginner’s exclusive FancyThemes coupon code helps you get 15% off on your purchase. All you have to do is follow the instructions below to properly redeem FancyThemes coupon code, so you can get best discount on FancyThemes. First thing you need to do is visit FancyThemes using the link on WPBeginner. Select the theme you want to purchase and then click on the ‘Buy Now’ button. On the checkout page, you need to click on ‘Have a discount code? Click to enter it’ . Clicking on it will reveal a form field where you need to enter WPBEGINNER15 coupon code and click apply button. You will now see your discount applied to the total amount. Next you need to select a payment method and provide personal information like email, name, address, etc. Click on ‘Purchase this order’ button to finish your purchase. We hope you found our FancyThemes coupon code to be helpful. At WPBeginner, we work hard to negotiate exclusive discounts for our users.